Our overnight mooring at Porto Pozzo was uneventful. No one came demanding payment and we slipped away at 9am after a good nights sleep. The weather was windy and sunny today, allowing us to charge the batteries with the wind turbine and solar panels and make drinking water from sea water as we sailed along the 30 miles to Isola Rossa on the Northern coast of Sardinia. 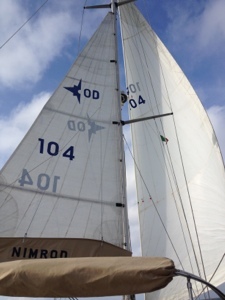 Most of the way the wind was directly behind Nimrod, allowing us to goosewing the sails – this is where the mainsail is on one side and the genoa in the other. 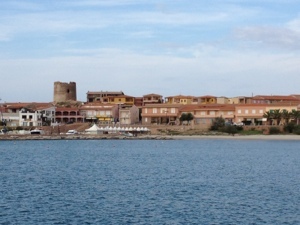 We have anchored outside the Isola Rossa marina and town, arriving whilst it was still sunny and warm enough to swim off the boat and check that the anchor had set. The town seems cute but obviously shut up for the winter now. Luckily, a local fish shop was open and so we think we have purchased red mullet for tea. 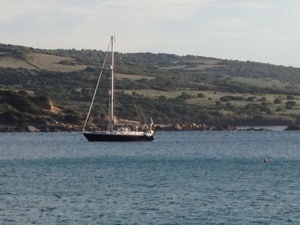 Pictures below of us goose winging today, Isola Rossa, Liz swimming to check the anchor and Nimrod in the bay.